Recently described by Early Music America as “a special artist with a brilliant future,” Alexa Haynes-Pilon has quickly established herself in the California early music scene performing on baroque cello, viola da gamba, baroque bassoon and dulcian. She has performed with the American Bach Soloists, Los Angeles Chamber Choir, Ergo Musica, San Jose Symphonic Choir, the Albany Consort, the American Ballet Company, Los Angeles Baroque Players, Con Gioia, and she is the principal cellist with Musica Angelica Baroque Orchestra. She co-founded Ensemble Bizarria, a Los Angeles-based early music chamber ensemble. In Toronto, she performed with Tafelmusik and Accenti Vocali, and was a founding member of the early music ensemble, Rezonance. She has appeared in most of the major Early Music festivals in North America including the Tafelmusik Winter and Summer Institutes, the American Bach Soloists Academy in San Francisco, Vancouver Early Music Festival, and the Boston and Berkeley Early Music Festivals. After completing her BM and MM in cello performance at Brandon University, Alexa Haynes-Pilon earned a performance certificate from the University of Toronto in connection with the Tafelmusik Baroque Orchestra, studying cello with Christina Mahler and viola da gamba with Jöelle Morton. 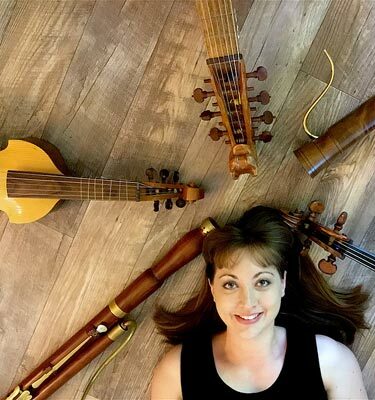 Alexa recently finished her doctoral studies at the University of Southern California, where she studied baroque cello and viola da gamba with William Skeen, and baroque bassoon and dulcian with Charlie Koster. Alexa’s passion is to create music and connect with members of the community, and because of this, she co-founded and is co-Artistic Director of Los Angeles Baroque (LAB), a community baroque orchestra based in South Pasadena, CA. In addition, for the past five years she has exposed thousands of elementary and secondary school students to Renaissance and baroque winds and viols through her work with the Crumhorn Collective, in collaboration with Ars Lyrica Houston’s outreach program in Houston. This past summer, she was a faculty member at the San Francisco Early Music Society (SFEMS) Recorder workshop. In November, she was a faculty member (viola da gamba and dulcian) at the Road Scholar Hidden Valley workshop in Carmel Valley, CA. This is Alexa’s first time teaching at PTEMW. A multi-talented instrumentalist with a big heart and boundless energy. She was a huge hit at the SFEMS recorder week last year! "It was great talking with Alexa and taking her classes. Her presence at the workshop was one of the highlights of my week - always so kind, helpful, and warm and I so appreciated it!" Watch Alexa Haynes-Pilon, viol, perform Diego Ortiz's Recercada quinta with Ensemble Draca. Composers were surrounded by animals—whether it be animals owned by their noble patrons, or animals roaming in the wild—many composers were inspired by animal sounds and imitated them in their compositions. Come explore works by Janequin, Le Jeune, Senfl, and more. English songs: it was a viol time! Come explore works for viol consort, and let’s add in a voice, or two, or five! Some of the most beautiful compositions include viol consort and voices. We will explore these works and dive into blending techniques, bow articulation/vocal diction, and more. There will be a strong exploration of the text and how to imitate the text with the bow. Composers will include Byrd, Dowland, Parsons, Greeves, and others.